Trubisky completed 26 of 43 passes for 303 yards and one touchdown in the Bears' 16-15 playoff loss to the Eagles on Sunday. Trubisky completed 18 of 26 passes for 163 yards with no touchdowns or interceptions in the Bears' 24-10 win over the Vikings on Sunday. He also rushed three times for 16 yards. 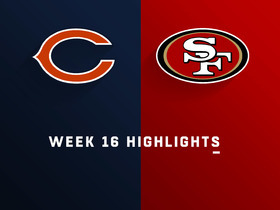 Trubisky completed 25-of-29 passes for 246 yards and a touchdown while adding three yards on the ground in Chicago's 14-9 victory over the 49ers. Analysis: Although the Bears trailed at the half, this game was close throughout, allowing Trubisky to function mostly as a game manager in a contest the team was able to control. After being a strong fantasy performer throughout the middle of the season, he's averaged just 189 yards and 1.25 passing TDs over his last four games, and he's turned into a low-upside fantasy option going into a tough Week 17 matchup at Minnesota. Trubisky completed 20 of 28 passes for 235 yards and two touchdowns during Sunday's 24-17 win over the Packers. He added 16 yards on three carries. He fumbled during the contest, but it was recovered by the offense. Trubisky completed 16 of 30 pass attempts for 110 yards, a touchdown and three interceptions in Sunday's 15-6 win over the Rams. He added 23 rushing yards on six carries. Trubisky (shoulder) practiced in full Friday for the third straight day and will reclaim his starting role Sunday against the Rams, Patrick Finley of the Chicago Sun-Times reports. Trubisky (shoulder) was a full participant at Wednesday's practice. Trubisky said Wednesday that his "arm feels really good" and noted that he's "ahead of schedule" in his recovery from an injury to his right shoulder, Patrick Finley of the Chicago Sun-Times reports. Coach Matt Nagy said Wednesday that he believes Trubisky (shoulder) will be ready to play Sunday against the Rams, Jeff Dickerson of ESPN.com reports. 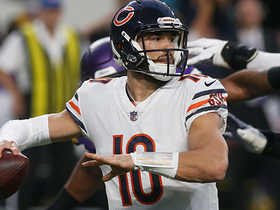 Analysis: During his media availability, Nagy relayed that Trubisky has been "throwing the ball well," according to Dickerson. Nagy added that Trubisky will have to look good in practice in order to make his first appearance since Week 11, so his activity level should be monitored closely to learn whether a return is possible. Chase Daniel would earn another start if Trubisky is unable to prove the health of his right throwing shoulder. Coach Matt Nagy said after Sunday's 30-27 loss to the Giants that Trubisky is showing improvement and remains day-to-day, Rich Campbell of the Chicago Tribune reports. Trubisky (shoulder) is inactive for Sunday's game against the Giants, Rich Campbell of the Chicago Tribune reports. Coach Matt Nagy said Trubisky (shoulder) did some throwing at Friday's practice, though it wasn't enough to prevent the Bears from listing him as doubtful for Sunday's game against the Giants. Analysis: Chase Daniel is expected to get another start Sunday, with Trubisky then expected to return for a Week 14 home game against the Rams on Sunday Night Football (Dec. 9). The 24-year-old quarterback has been listed as a limited practice participant throughout the week, but there hadn't been any report of him throwing passes prior to Friday. His progress at the end of the week suggests he could have a fairly normal practice schedule next week. Trubisky (shoulder) is listed as doubtful for Sunday's game against the Giants. Trubisky said Thursday that his shoulder injury is a short-term concern, Rich Campbell of the Chicago Tribune reports. "I feel good," Trubisky stated. "It's not something that's going to [restrict] me in the long term." Coach Matt Nagy said that Trubisky (shoulder) would be a limited participant in Thursday's practice. Trubisky (shoulder) is planning to sit Sunday against the Giants in favor of Chase Daniel, Mike Garafolo of NFL Network reports. Analysis: Trubisky officially made his return to practice Wednesday, but it appears the team will continue to avoid taking any chances with its quarterback of the future. Chase Daniel will be in line to start his second consecutive game against the Giants, while Trubisky is likely eyeing a Week 14 return for a home matchup against the Rams. Trubisky (shoulder) was listed as a limited practice participant Wednesday on the Bears' injury report, Dan Wiederer of the Chicago Tribune reports. Coach Matt Nagy said that Trubisky (shoulder) isn't expected to practice Wednesday and remains day-to-day ahead of Sunday's game against the Giants. Trubisky (shoulder) remains hopeful to suit up in the Bears' Week 13 game against the Giants but it's uncertain if he'll be available for that contest, a source told Adam Schefter of ESPN. 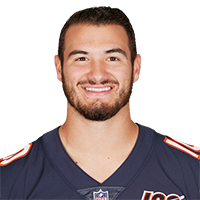 Trubisky (shoulder) is inactive for Thursday's game at Detroit, Patrick Finley of the Chicago Sun-Times reports. Trubisky (shoulder), who is listed as doubtful for Thursday's game against the Lions, will cede starting duties to Chase Daniel this week, a source told Adam Schefter of ESPN. Trubisky (shoulder), who is listed as doubtful for Thursday's game against the Lions, is dealing with an AC joint sprain, a source tells Adam Schefter of ESPN. The Bears are officially listing Trubisky (shoulder) as doubtful for Thursday's game against the Lions, Kevin Fishbain of The Athletic reports. Coach Matt Nagy said he doesn't expect Trubisky (shoulder) to practice Tuesday but is "cautiously optimistic" the quarterback will be able to start Thursday's game against the Lions, Kevin Fishbain of The Athletic reports. "I can't make any promises. I hope [Trubisky plays Thursday] but it's a day-to-day thing for us," Nagy said. "He wants to play, I know that. We've gotta make sure in these situations we're doing the right thing." The Bears are optimistic that Trubisky (shoulder) will be available for Thursday's game against the Lions, Adam Schefter of ESPN reports. Trubisky (right shoulder) was listed as a non-participant on the Bears' estimated injury report Monday. Trubisky completed 20 of 31 pass attempts for 165 yards, a touchdown and a pair of interceptions in Sunday's 25-20 win over Minnesota. He added 43 more yards on 10 carries. Trubisky completed 23 of 30 passes for 355 yards with three touchdowns and no interceptions in the Bears' 34-22 win over the Lions on Sunday. He also rushed three times for 18 yards and another score and completed a two-point conversion pass. Trubisky completed 12 of 20 passes for 135 yards, a touchdown and an interception during Sunday's 41-9 win over Buffalo. He had a 6-yard run during the game. Trubisky completed 16 of 29 passes for 220 yards and two touchdowns while adding 51 yards on six rushing attempts in Sunday's 24-10 win over the Jets. Trubisky completed 26 of 50 passes for 333 yards, two touchdowns and two interceptions while adding 81 yards and a touchdown on the ground in Sunday's loss to the Patriots. Trubisky completed 22 of 31 passes for 316 yards, three touchdowns and an interception while rushing eight times for 47 yards in Sunday's 31-28 overtime loss to Miami. Trubisky completed 19 of 26 passes for 354 yards with six touchdowns and no interceptions in the Bears' 48-10 win over the Buccaneers on Sunday. He also rushed three times for 53 yards. Trubisky completed 22 of 35 passes for 220 yards and one interception in Sunday's 16-14 victory over the Cardinals. Trubisky completed 25 of 34 passes for 200 yards, two touchdowns and two interceptions in Monday night's 24-17 win over the Seahawks. He also rushed five times for 24 yards. Trubisky completed 23 of 35 passes for 171 yards during Sunday's 24-23 loss to Green Bay. He also rushed seven times for 32 yards and a touchdown. Trubisky won't play in Saturday's preseason matchup with the Chiefs, Adam Hoge of WGN Radio 720 AM Chicago reports. Analysis: Trubisky is being rested, along with many of the Bears' starters, for Saturday's game. The team effectively has five preseason games since they played in the Hall of Fame Game, and head coach Matt Nagy is pleased enough with how the team has looked in practice that he won't risk injury to many key players. Look for Chase Daniel to draw the start in place of Trubisky. Trubisky completed nine of 14 passes for 90 yards with a touchdown along with an interception in Saturday's preseason game against the Broncos. 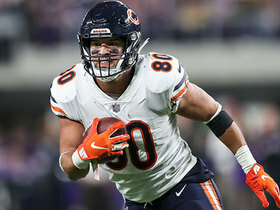 Analysis: Trubisky was able to find TE Trey Burton on four occasions, resulting in 45 yards and a score. It appeared that the coaching staff made that connection a focus in the contest. 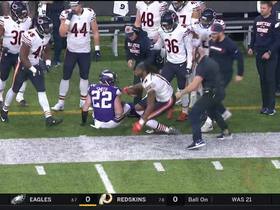 On his interception, the quarterback appeared frustrated that Tarik Cohen didn't flatten out his route, which allowed the defensive back to step in front of Cohen to pick off the pass. In fantasy drafts, it'll only take a low investment to select Trubisky as a backup with potential for upside. Trubisky completed two of four passes for four yards during Thursday's 30-27 loss to Cincinnati. Trubisky will take the field for Thursday's preseason game at Cincinnati, Adam Hoge of WGN Radio 720 AM Chicago reports. Analysis: Trubisky was among a cadre of Bears that were held out of the Hall of Fame Game, but coach Matt Nagy will allow the quarterback to see his first exhibition action of 2018 this week. 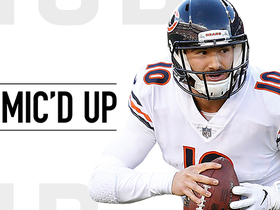 While Trubisky's reps are to be determined, it wouldn't surprise if he's limited to one or two series before giving way to Chase Daniel and Tyler Bray under center. Although he's made some impressive throws, Trubisky has struggled with poor decision-making and poorly placed passes during the first few practices of training camp, Rich Campbell of the Chicago Tribune reports. Analysis: In addition to learning a new offense, Trubisky is working with primary pass catchers who joined the Bears this offseason. He's started just 12 games in the NFL and made 25 total starts since high school, so as talented as he may be, shaky practice performances like these should still be expected. As long as Trubisky shows steady progress throughout camp, he'll continue to be worth a draft pick as a fantasy backup with upside. The Bears traded up in the second round of the 2018 draft to select wide receiver Anthony Miller out of Memphis to give Trubisky his fourth new receiving weapon of the offseason, Mark Potash of the Chicago Sun-Times reports. Bears head coach Matt Nagy expects to run an aggressive offense in 2018 that promises lots of downfield attacking, an aspect that should enhance Trubisky's production, Adam Jahns of the Chicago Sun-Times reports. Trubisky gains three established receiving options on the first day of free agency, Dan Wiederer of the Chicago Tribune reports. Trubisky said Tuesday in appearance on 670 The Score Chicago that he was "really excited" when he heard the Bears had hired former Chiefs offensive coordinator Matt Nagy to replace John Fox as head coach, Rich Campbell of the Chicago Tribune reports. "Just watching the Kansas City offense last year, what Coach Nagy brought -- I was able to meet him through the draft process last year, and we really connected," Trubisky said. "I was really excited when I heard he got the job here. I know Chicago is going to have a warm welcome [for] him, and he's going to bring amazing offensive ideas to the table." Trubisky completed 20 of 36 passes for 178 yards while adding two yards on one rushing attempt in the Bears Week 17 loss to the Vikings, finishing his rookie season with 2193 passing yards to go with seven touchdowns and seven interceptions in 12 games. Trubisky completed 14 of 23 passes for 193 yards while adding 44 yards and a touchdown on the ground in Sunday's 20-3 win over the Browns. Trubisky completed 31 of 46 passes for 314 yards with one touchdown and three interceptions in Saturday's loss to the Lions. Trubisky completed 25 of 32 passes for 271 yards and a touchdown and also rushed twice for five yards and a score during Sunday's 33-7 win over Cincinnati. Trubisky completed 12 of 15 passes for 102 yards and a touchdown in Sunday's 15-14 loss to San Francisco. He added 19 yards on four rushing attempts. 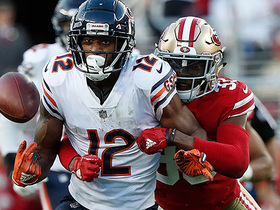 Analysis: The rookie took advantage of a short field and drove for a touchdown on the Bears' second drive of the game, but the Bears were unable to muster anything after that and only possessed the ball for 21 minutes in the contest. It was the most efficient effort of Trubisky's career so far, as he managed to complete 80 percent of his passes. He will have an even tougher test Week 14 at Cincinnati. Trubisky completed 17 of 33 passes for 147 yards and two interceptions during Sunday's 31-3 loss to the Eagles. He rushed for 12 yards on four carries during the contest. Analysis: It was certainly a step back for Trubisky, who had as many picks against the Eagles on Sunday as he had through his first six career starts. The Bears' typically conservative approach didn't stand a chance with the Eagles up by multiple scores early. With no multi-touchdown games this season and just one performance of over 180 passing yards, the rookie shouldn't be on your radar. Trubisky completed 18 of 30 passes for 179 yards and a touchdown during Sunday's 27-24 loss to Detroit. He added 53 yards on six carries and lost a fumble during the game. Analysis: Trubisky padded the Bears' early lead in the first quarter with a one-yard touchdown in the back corner of the end zone to fellow rookie Adam Shaheen. The fun, for the most part, stopped there as a Trubisky fumble led to the Lions' first touchdown in the second quarter. Trubisky has been excellent at playing Foxball, head coach John Fox's conservative brand of football, with just one pick in his last five games. Still, with just three touchdowns in that span, he shouldn't be on your radar. Trubisky completed 21 of 35 passes for 297 yards and a touchdown during Sunday's 23-16 loss to Green Bay. 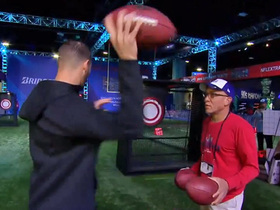 Chicago Bears quarterback Mitchell Trubisky shows off his accuracy in a passing challenge with NFL Network's James Jones. 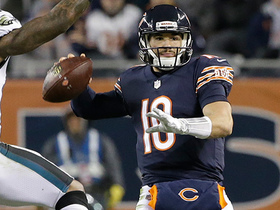 Watch how Chicago Bears quarterback Mitch Trubisky shows arm strength in the wild card game against the Philadelphia Eagles. Chicago Bears quarterback Mitchell Trubisky lofts a pass to linebacker Nick Kwiatkoski for a successful two-point conversion. 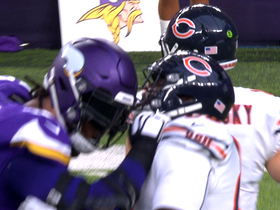 Linemen on the Chicago Bears and Minnesota Vikings have their face masks get stuck together. Chicago Bears wide receiver Kevin White does an outstanding job of racing backwards to make a leaping catch along the sideline. 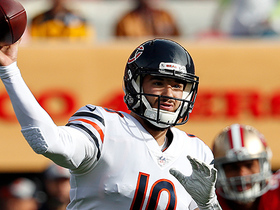 Listen to Chicago Bears quarterback Mitchell Trubisky's best moments as he guided the Bears to a win over the San Francisco 49ers in Week 16. Chicago Bears quarterback Mitchell Trubisky delivers a perfect strike to wide receiver Anthony Miller for a goal-line touchdown.